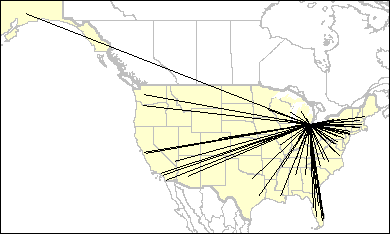 The map on the right illustrates all non stop flight from Detroit Metropolitan/Wayne Cnty by major air carrier. The table that then follows lists all airport destinations served from Detroit Metropolitan/Wayne Cnty by city, by airport, by major carrier. In addition, the number of flights, timeliness, and cancelations are also shown. Source: US Bureau of Transportation Statistics.